It’s hard to post something fabulous after a bake-off win, but let me introduce you to my new friend, the Komatsuna Green. This delicious little leafy thing came in my first Vegetable Husband basket (a service I’m eternally thankful to Leigh for posting about) and I knew it was the first ingredient I wanted to use this week. After a bit of research, I learned that Komatsunas are a relative of the turnip but are also called Spinach Mustards in the US. Grown almost exclusively in Japan, Taiwan, Korea, and now, apparently, the state of Georgia, it’s a rich source of calcium that can be stir-fried and pickled, or used like bok choi in any dish. I decided to stir fry it with dry-fried tofu in a ginger almond miso sauce recipe from About.com. As much as I love cookbooks themselves, I kind of majorly love the internet as well. I would have never used this sauce otherwise. I chopped up the komatsuna greens like I would bok choi, stir-frying the stems first and then the leaves, and the recipe worked perfectly. 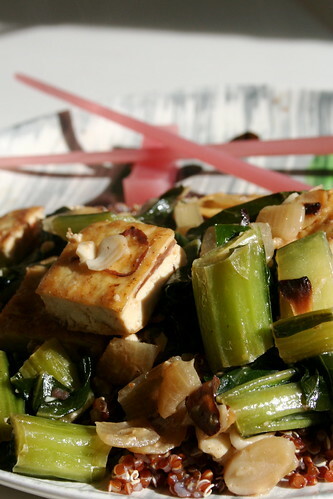 The flavor is a bit stronger that bok choi–more green? if that’s a flavor…–and the sauce was bit too salty for me–maybe you should use a red miso instead of white–but I like the combination mostly. If you have the chance to pick up some komatsunas, do! I’d love to see them turn up in my next basket! Dry fry the tofu. I divide to tofu into 2 batches to do this. After it is crisped the way you prefer it, set it aside on a plate to add to the stir-fry later. Chop the komatsuna stems into 1/2 inch pieces. Julienne the leaves. Heat up a wok (without oil) and add the almonds. Stir-fry quickly until fragrant and toasted, about 45 seconds. Remove. Then in the wok, heat up 1-2 tbsp of sesame oil on medium heat. Add the onion, cook for 6-7 minutes or until the onion turns clear and soft. Add the garlic and cook for one minute. Add the komatsuna stems and cook for 5 minutes. Add the leaves and cook for another 5 minutes. While the komatsunas are cooking, combine the soy sauce, miso, and vinegar until smooth and set it aside. When the greens are tender, add the tofu and then drizzle with miso sauce and sprinkle with almonds. I’ve never seen this veggie before, but the dish you made sounds so good, I’d love to try it with bok choi. That’s a gorgeous picture; the dish looks delectable! I’m going to definitely try that sauce sometime. I LOVE miso sauces. We liked our komatsunas a lot, too! We just tossed them in a stir fry, though. Not nearly as exciting as your dish. I need to make way more gingery asian type sauces, and that komatsuna stuff looks delicious! I love mysterious greens. mmmmmmmm, mmmmmmmmmmm! i need to get my hands on some komatsuna greens! totally going to see if my local asian market has some next time i’m in there! your dish looks too delicious not to try! and yeah, miso can be pretty darn salty – sometimes we add it to soups instead of sea salt! thanks for the recipe! wahoooooo! Never heard about these greens, but the dish you created looks really delicious! I’ve never seen those greens before but they certainly sound yummy! I’ll keep an eye out for them the next time I’m at the Asian grocer. Oooh! SO fabulous! We haven’t had any of those since living in California, and we hope we find some when we’re home for Christmas! I got some komatsuna seeds at the Japanese-American Museum in L.A. and popped them into my garden with no idea what they would produce. Now they’re ready (talk about easy to grow!) and I’m looking for recipes. I’m posting here just to point out that you can grow your own with very little effort. One more thing — the recipe doesn’t say what to do with the quinona or rice. Cook it and mix it in, I presume? Hey Jim, just serve the komatsuna on the quinoa! Another dumb question: I see “cloves of ginger” in the ingredients, but garlic in the instructions. Since this is a gingery sauce (and since I’m something of a beginner) — which is it? I’m pretty sure ginger doesn’t come in cloves (looks more like some kind of diseased toes) but I want to get it right. I meant garlic, not ginger. I used ground ginger when I’m out of fresh, which would be the 1/2 tsp ground ginger, but you can also substitute 1 inch of grated fresh ginger for the ground. Can you believe it? One more dumb question: the recipe doesn’t say when/where the ground ginger goes in. I’m assuming the miso/soy/vinegar dressing? But I’d like to know for sure. Thanks, you’ve been most patient.